A couple of weeks ago, our team headed to Brazil for RubyConf and the event was a great success! Developers call Ruby a beautiful, artful language. And yet, it’s handy and practical. The same applies with Jelastic’s dashboard panel and a wide range of complex features. We asked Jelastic CTO and Founder Ruslan Synytsky some questions about RubyConf and his presentation. Last week you attended and presented at RubyConf Brazil. Can you tell us about your presentation? Our presentation was devoted to Jelastic Ruby and our main advantages, such as live migration, automatic scaling, SSH access, and many others. The main part of the presentation contains information about the implementation of Ruby in Jelastic, how we chose the correct implementation, which Ruby features we support. We paid special attention to the flexibility of the platform. Is there a large demand or awareness of Jelastic in Brazil? Yes. We currently have 3 commercial partners in Brazil – Locaweb, Websolute and HostDime. They are rapidly evolving and are interested in the development of cloud-based technologies with Jelastic. In addition, we want to mention Bruno “The JavaMan”, who particularly appreciates our contribution to the development of cloud technology in Brazil. In your opinion, what is the most popular programming language in the region? There is no leading programming language. Each programming language is good in its own way. In the enterprise solutions, Java and .Net are more used. But judging by the number of conference attendees in Ruby, it is also among leaders. You also presented live Ruby Demos. What were the most frequently asked questions by developers and the answers to those questions? Some developers asked about how to deploy applications via GIT. It is pretty easy in Jelastic and can be done just in few clicks. Also, we offer automatic updates of the app deployed via GIT/SVN. This process can be customized based on the needs of a user. This simplifies the configurations and management of your applications. In addition, we also shared how to execute rake tasks and start specific daemons and we demonstrated the functionality of our SSH gate, and how it all works without an external IP. How long did it take the Jelastic Engineers to provide Ruby on the platform? From the very beginning, Jelastic has been architectured as a polyglot platform so now it is not that complicated to add a new programming language. It took just few days to implement internal testing variant of the working Ruby on our platform. And it lasted about 4 months before the release of the first beta version of Jelastic Ruby. We had a need to cover a standard set of tools, which is used by Ruby developers. The main problem has been associated with the dependency management. The main usability of Ruby is the presence of Gems, which is a set of libraries that allows you to accelerate the development using popular third-party integration tools for databases and the client-side and many others. The main problem is the number of dependencies that they need. We needed to provide an automatic solution for any dependencies Gems. So we wrote our own solution, which just simply works. Can you tell us which Ruby Application Servers Jelastic supports? 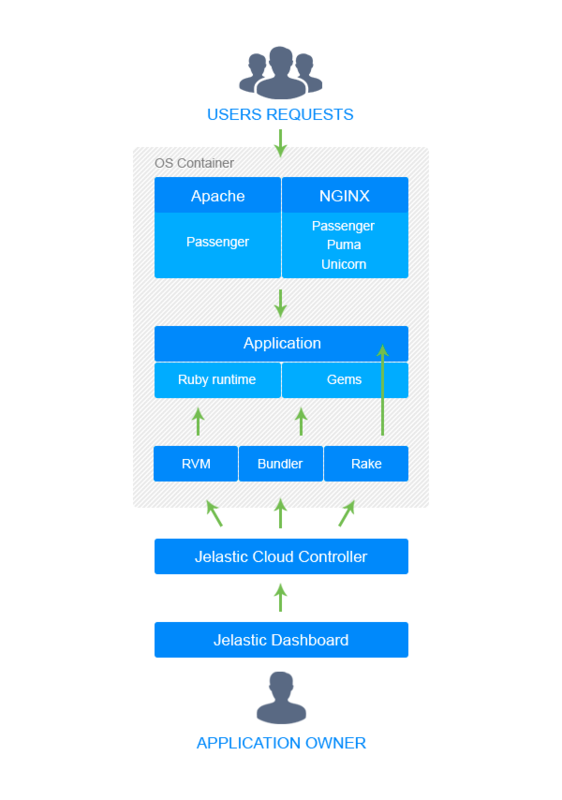 Jelastic now supports: Apache/NGINX + Passenger, NGINX + Unicorn, Thin, Puma and Rails server. Which Ruby versions does Jelastic support? Jelastic have pre-installed versions of Ruby: 1.9.3, 2.0.0, 2.1.1. We also support Bundler Gemfile, where users can define a specific version of Ruby for their application. When a user switches the versions from one to another, Jelastic performs resolving dependencies. Can you share an image of Jelastic’s Ruby Architecture? RVM is a command-line tool which allows you to easily install, manage, and work with multiple ruby environments from interpreters to sets of gems. RVM is standard tool for Ruby developers. Bundler provides a consistent environment for Ruby projects by tracking and installing the exact gems and versions that are needed. It is an exit from dependency hell, and ensures that the gems you need are present in development, staging, and production. Can you tell us the benefits of using Ruby on Jelastic Cloud? How does Jelastic fare against the competitors? Which programming languages does Jelastic currently support? Jelastic now supports: Java, PHP, Ruby, Python, Node.JS, and at the end of this year, .NET. What about Node.js? When will this be released? It is in high demand and will be released at the end of September. We’ve made it easier than ever to develop and run Ruby apps, without vendor lock-in, in the data center of your choice, worldwide. If you would like to test out Ruby on Jelastic’s cloud and share your experience and feedback, please sign up for a 2 week free trial!